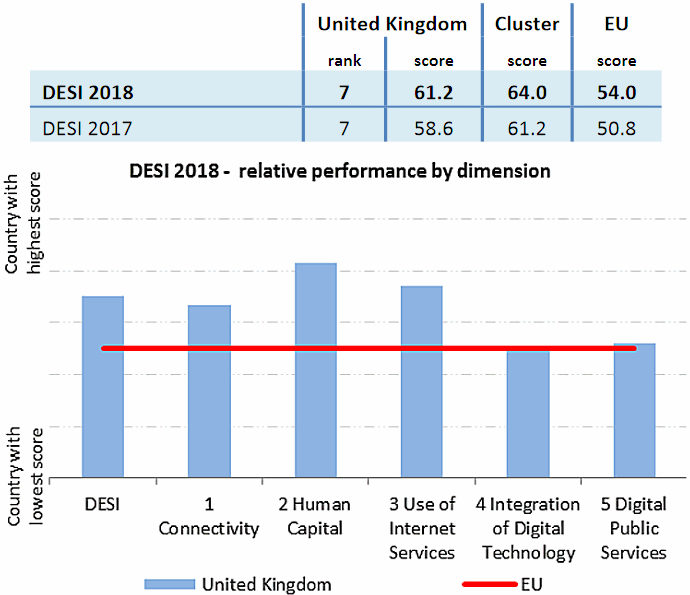 The European Commission has publish their 2018 Digital Economy and Society Index (DESI), which uses data from 2017 and 2018 to reveal the United Kingdom’s progress toward the EU’s Digital Agenda goals (e.g. NGA 30Mbps+ broadband for all by 2020). This year we remain ranked 7th out of 28 member states. In case anybody has forgotten, the Digital Agenda for Europe (DAE) set several targets but the main ‘Connectivity’ related one called for every home to gain access to a 30Mbps+ capable Next Generation Access (NGA) broadband connection by the year 2020. On top of that it also called for 50% of consumers to be “subscribed” to a 100Mbps+ service (not the same as coverage). The good news is that the United Kingdom continues to belong to the “high performing cluster of countries” and we’re particularly strong in the all-important area of digital connectivity, where we also rank 7th and that’s an improvement from 8th last year. Overall our general rank is 7th – across all categories – and that’s unchanged from 2017. The UK coverage of NGA style broadband networks (FTTC, FTTH, DOCSIS etc.) has increased to 94% (compared with 80% across the EU), which puts us ahead of major economies like Germany, France, Italy and Spain but behind several other countries (e.g. Malta, Belgium, Netherlands, Portugal, Denmark and Luxembourg). We also do well for rural coverage. 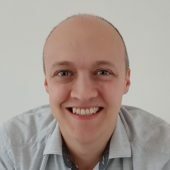 Some people may be surprised by this result, particularly with so many other EU countries now investing much more heavily than the UK in Gigabit capable “full fibre” (FTTP/H) networks, but the reason predominantly relates to Openreach’s (BT) focus on deploying hybrid-fibre (FTTC / VDSL2) upgrades that are cheap and relatively quick to rollout. By comparison FTTP/H is much faster but also very expensive and slow to deploy. On top of that Virgin Media’s Hybrid Fibre Coax (HFC) based DOCSIS cable network can now reach about half of the country with ultrafast broadband speeds of 350Mbps and they aim to cover around 60% of UK premises by the end of 2019 or 2020. 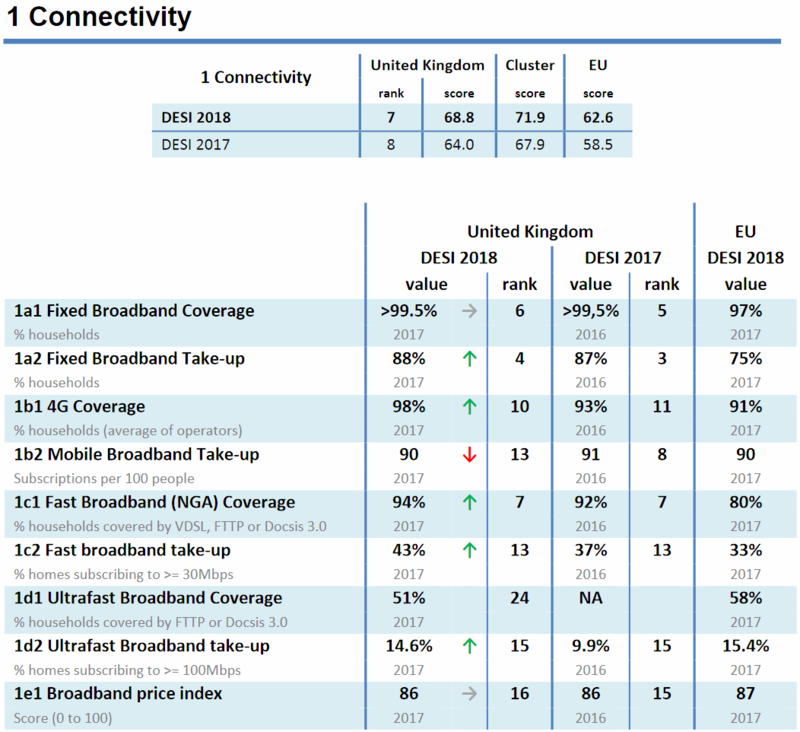 Overall this focus on hybrid fibre gives the UK a good standing in NGA / “superfast broadband” (30Mbps+) availability, but we are much weaker when looking at “ultrafast” (100Mbps+) connections. The second chart below only shows FTTP/H availability and as you can see the UK is barely even visible and we’re well behind almost everybody else. As above, FTTP and Docsis 3.0 cable networks are both capable of delivering ultrafast fixed line connectivity. Cable covers 45%, while FTTP covers 27% of EU homes. However cable and FTTP networks do tend to overlap, and mainly cover urban areas. The EU estimates that some 57% of homes have access to at least one of these ultrafast technologies. The good news is we’re finally starting to turn a corner and it looks like there will be a rapid improvement in national FTTP/H coverage over the next few years. At present only around 3-4% of UK premises can access such a connection (Ofcom data) but check out our ‘Summary of Full Fibre Broadband Plans and Investment‘ for a better understanding of what’s coming. On top of that the EU’s data has yet to factor in the future impact of hybrid fibre G.fast technology, which can also deliver ultrafast speeds. Openreach are deploying that to 10 million UK premises by 2020. The EU’s data is currently too old to reflect the start of this, although Virgin Media’s overlap in urban areas may overshadow it but in time that may change. Elsewhere 4G Mobile (Mobile Broadband) coverage has reached 98% in the UK (households), which compares with 91% across the EU. There are several challenges regarding broadband deployment in the UK. Four per cent of the UK premises have no access to decent broadband of at least 10 Mbps. Regarding NGA coverage the urban-rural digital divide is still obvious (rural coverage was at 82 %). The share of FTTH/B connections (1 %) is one of the lowest in the EU. The regulatory [10Mbps] USO and the measures set out in the UK digital strategy can bring improvements in this regard. 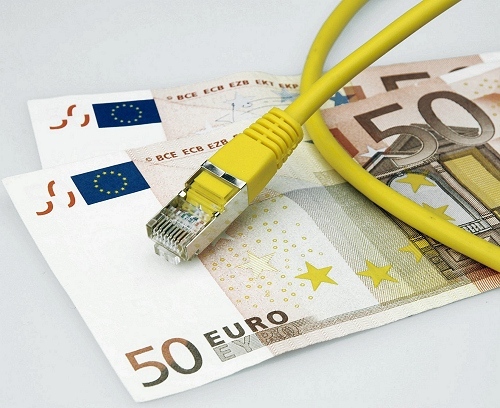 The potential of the transposed Broadband Cost Reduction Directive, to contribute to the deployment of high speed broadband connections is not fully exploited yet. The benefits of the legal separation of BT and Openreach, which is not fully completed, are not visible on the market yet. Ofcom’s increased focus on consumer matters and targeted actions in this regard bring clear benefits. At this point some may recall that in 2016 the European Commission proposed a new non-binding Gigabit Society target for “all European households” to get a minimum download speed of 100Mbps+ by 2025, with businesses and the public sector being told to expect 1Gbps+ (here). Since then this seems to have been swept under the carpet and the main focus continues to reflect the 2020 DAE goals. At present the UK government’s most recent data claims that 95% of premises can access a superfast broadband connection and they expect this to reach 98% by the end of 2020, with the final 2% being supported by the new legally-binding 10Mbps USO. However as time progresses it looks like the UK could find itself lagging behind as the focus turns more toward FTTP/H and rural coverage of “ultrafast” services. 7th for NGA coverage, 6th in rural areas. 24th in ultrafast coverage. The only nation in the EU with higher FTTP coverage in rural areas than urban. Yet there will still be the endless posts about how massive the digital divide is, how hard done by the UK’s rural areas are, and how we all must, through our taxes and our bills, subsidise FTTP to them. Along likely with copious amounts of posts about what a no-brainer it is to do this, apparent astonishment that private operators haven’t dived in to this apparently fantastic investment, and orgasmic murmurings about gainshare BDUK funds and the, actually pretty minimal, increment in coverage they can provide given the fixation on the hardest to reach and, hence, most expensive, areas. The obvious use for the BDUK gainshare is, IMHO, to firstly concentrate on premises stuck below the contract threshold and focus an FTTP overbuild on the most economically expedient of those, moving progressively onto more expensive areas to try and maximise the number of premises covered. Yes, even if, and it inevitably would, this means those terrible urban types receiving some of it and it funding 32 urban premises for the same price as 2 premises in a rural hamlet. Is there a particular reason that it has taken up until now for companies in the U.K. to truly start investing in FTTP. When they have been across rest of EU already for years. Quite a few smaller operators, such as Hyperoptic, B4RN, Cityfibre, Gigaclear and so forth have also been investing in FTTP/H for years but until fairly recently they’ve only done so at a smaller scale vs the major operators. The recent improvements in regulation (access to cable ducts etc. ), as well as new support from the government (tax breaks on business rates, funding etc. ), have helped to give things a push. In a lot of EU countries fttp rollout was non-regulated or the incumbent was given a number of years where they didn’t have to wholesale the capability so that they could recoup the investment. Some countries have lower quality copper networks and the end of the road with xDSL is thus reached more quickly. Also higher density cities with lots of apartment blocks make rollout easier. There’s a rough correlation whereby countries that have gone full speed into fttp don’t have great rural coverage – the point Mark was making above. I am glad that the Rural areas in this country have not been left behind and the works of Gigaclear and B4RN are certainly to be applauded for finding a model that works for these situations. Hopefully now with recent improvements and support we will see serious investment put down. FTTC as we all know is certainly a stop gap measure and G.Fast certainly for a lot of areas might not help to much. Hull obviously is a smaller city but KCOM plan to nearly completely overhaul there network seems to have paid off must be one of the best connected Cities in europe for FTTH. Ironically, it isn’t really the work of Gigaclear or B4RN that has helped bring high coverage levels of “superfast” speeds to rural UK. It is really down to the combination of choice of hybrid FTTC by BT, and the top-up funding provided by BDUK, LAs and the ERDF. BT weren’t shy about saying that their aim was to get a speedier deployment covering more premises, more so than chasing absolute speed. BDUK has funded NGA coverage (at 24Mbps+ speeds) to around 4.8 million premises so far. million. Gigaclear has covered about 60,000 premises in total (including their commercially-funded areas), so represent perhaps less than 1% of the coverage so far. Average BDUK takeup looks to be somewhere around 45% at present, so around 2 million subscribers taking advantage of that rollout. Gigaclear has about 15,000 subscribers, so again seem to represent less than 1% of the takeup. B4RN had around 3,300 subscribers (using figures from last year). B4RN’s advantage isn’t from a high total amount of coverage. It is from guaranteeing 100% coverage of the places they do cover… there are no get-outs for long lines. But it makes for a slow process. It is hard to define Hull as one of the best connected cities, when fewer premises have superfast speeds than most cities in the UK. KCOM will get there, but they only managed to speed up their deployment when they eventually put serious money into it – before that they were really *very* slow at rolling out. Where did they get that money? By selling off their national network to CityFibre. And plaudits for becoming the best connected city won’t bring them any extra income. It is still a sad fact of life that most subscribers are still buying the lowest package. And if there were much additional demand for ultrafast speeds, then VM would be growing their market share. But that isn’t happening. And that probably explains why companies haven’t bothered spending the amount of money needed for FTTP: there is little appetite for paying the higher monthly charges. This was a community initiated project by Chris Conder and a group of villagers (mainly pensioners) in Rural Lancashire who were left frustrated with the fact that BT wouldn’t even lay FTTC. Their standard ADSL broadband could not even achieve 1Mbps. There’s a video on youtube that you can watch one lady compared side by side her internet speed comparison. So the villagers decided that they’ll dig the soil and lay the fibre optic cables themselves. It was somewhat easier for them to do that because the countryside area doesn’t have enough asphalt, roadblocks, etc. It is mainly soil and grass which doesn’t require planning permission to dig. Plus of-course the residents have their own individual houses, no buildings thus no wayleave agreement required either. I think in many of these rural areas people don’t even have FTTC to begin with. Hence why B4RN were so ambitious to lay their own FTTP network. Because let’s face it, majority of the people who will have FTTC will probably settle with that instead and won’t be ambitious enough for FTTP. The fact that they were motivated to take the responsibility for a big project like this is an indicator how frustrated they were with their present internet connection. BT had no plans to lay fibre in near future as they said it’s not economically viable. Gigaclear in the same way came to take advantage of the situation that many rural areas don’t have FTTC. That’s why they are exploiting their customers with £76.60 per month for 1Gbps. But in urban areas FTTP package prices are much more reasonable. Community Fibre 1Gbps is £50 and Hyperoptic is £49 and with the flash sale currently on offer it drops the price down to £39 for first 12 months. I’d definitely pay that! TalkTalk York 1Gbps is only £25 per month cheapest in the UK! While B4RN is actually £30 a month for 1Gbps because it’s a community project. Paradoxically many of these FTTP packages happen to be cheaper than ADSL/ADSL2+ up to 17Mbps. It makes me jealous. I used to pay until recently to Sky £32.89 just for 17Mbps for customer loyalty which after a phone call they reduced the price to £21.50. @Matthew – Kcom is one of the operators with a lower quality copper network; in their case, smaller conductors. They have to move to FTTP because the end of the road has been reached with their copper. @Rahul. Gigaclear are not exploiting their customers at £76.60 for 1Gps. That’s the price if you 1Gbps (up and down), but if you choose a lower speed package you can get 50Mbps (up & down) for £41.30 pm. That’s similar to what you pay for BT Infinity via FTTC (if you can get it) with a much higher latency and a much slower upload speed. Gigaclear also offer a great feature to all customers who may want 1Gbps for a couple of days to dowload a set of videos or re-organise a cloud based photo album…. For a fiver you can crank up your speed to 1Gps (up and down) for 48hours simply by clicking boxes on your Gigaclear account portal. How many other suppliers allow you to do that? So lets hear no more about exploitation. I’ve already mentioned in my post TalkTalk York 1Gbps=£25 B4RN 1Gbps=£30 Hyperoptic 1Gbps=£39 with the AMAYZING Promo code and lastly Community Fibre 1Gbps=£50. Which to be fair is still too much but at least those prices are more reasonable. However, £76.60 is more than double the cost of the other Altnet FTTP providers. 50Mbps at £41.30 is still double compared to Community Fibre 40Mbps for £20 Hyperoptic 30Mbps is £18 a month. And in Bulgaria and Romania some providers offer 1Gbps for only €20 a month! That’s not normal. I’m originally half Bulgarian-Bangladeshi myself. I’ve got one Facebook friend in Bulgaria who tells me he pays 15 leva to Bulsatcom for 100Mbps and that is equivalent to £6.71. Actually here’s the evidence if you don’t want to believe me and for the other viewers reading this! http://www.bulsat.com/internet.php It’s in Bulgarian language. Scroll down you’ll see 100Mbps=15 leva while 200Mbps=28 leva (£12.53)! How do you explain those price differences? My assumptions are that Gigaclear is the dominant force in rural areas and there is no other FTTP competitor out there that is competing with Gigaclear so they put the prices up knowing that the customers will feel helpless with no other choice but to subscribe to Gigaclear. Just wait one day when an alternative FTTP provider comes to rural areas where Gigaclear serves and immediately the competition will force Gigaclear to lower their price packages or risk losing business. Sorry comparing broadband prices across countries is misleading especially CEE. Prices for things in Bulgaria (cars, food and especially housing) are roughly 5 or 6 times lower than they are here. Therefore the comparative cost would be much higher. Everything will be cheaper including laying cables etc. But I do like Bulsat refering to “Optical Internet” to distinguish their full fibre product. Remember OFCOM has perpectuated a “what the market will stand” policy. If they had any consideration for the consumer then things would be a lot different. @Meadmodj You’re right about housing that’s definitely much cheaper. We have a 2 bedroom flat in Sofia, Bulgaria that costs around £45,000 and has FTTP access. 75% of Bulgaria do have access to FTTP. However, life is very expensive for food and clothes in ratio to income. Food is almost like British prices. Only alcohol is cheap. National Minimum Wage is 460 leva a month that’s £205.86 in a month! That’s why so many Bulgarian people come to live in the UK. There are at least 150,000 Bulgarians living in the UK 2011 estimate. If life was very cheap there, heck even I would go and live there and have Fibre. But economically it would be expensive in other aspects overall. Maybe this is the reason why Fibre broadband is so cheap there like you said, due to cheap labour in laying cables and also most Bulgarians wouldn’t be able to afford higher subscription costs so they had to lower the price package to consider people’s incomes. But going back to the prices for FTTP in the UK. Life in UK rural areas is cheaper than in urban areas such as lower house prices and rent. Hyperoptic, Community Fibre manage to offer significantly cheaper FTTP packages in London and other major cities compared to that of Gigaclear in rural areas. There is quite a big difference between £50 and £76.60 for 1Gbps that’s what I am pointing out. Maybe in future when there is a greater FTTP expansion in the UK prices will be more balanced. But I also wonder how TalkTalk UFO York FTTP manage to offer 1Gbps for only £25 1000Mb only £25 a month, for 24 months, no set-up fee! This is what I find strange. Complexity. Community Fibre are targeting high density housing. Its not always clear what technology is actually being used within the tower blocks. Hyperoptic also focus investment. They get high economies of scale and to ensure pay back will offer discounts or low rates to ensure residents wanting moderate speeds do not drift back to the parasite ISPs (on OR) or they will not have sufficient takeup. Both pass many properties they are just not interested in. Gigaclear have a much more mixed areas of population and are cabling to each house in turn. They will run out of steam at some point and will also need to balance pricing to fend of the parasite ISPs. TalkTalk UFO York FTTP are in the same position. They need a certain takeup to make it work. Rather than set different speeds they are going for the 1Gbs to ensure they capture sufficient customers from copper broadband. They are probably being measured on successful uptake rather than revenue in the short term. I would treat this just like the sales prices you see on other ISPs, it is to entice users in. It could be that they know most users will never utilise the speed so the contention ration to the backhaul bandwidth is probably high. FTTP costs are coming down. OR offers FTTP free to new developments of over 30 houses so the costs must be getting close to new copper infrastructure. What we now need is Openreach to start FTTP for both the Exchange Only Lines as well as the rural non FTTC lines and then work inwards to replace FTTC over time. We will only get real competition once we have at least two Ultrafast options in direct competition. Comparing them currently is chalk and cheese. Ok many thanks for the explanation, Meadmodj! That probably explains why Hyperoptic and Community Fibre are offering more reasonable prices! I forgot that indeed they get better revenue in return from high rise buildings compared to doing the same project to individual houses like what Gigaclear are doing. In that case I should have an advantage living in a high rise building near the City of London with 82 flats in it, there’s a higher chance of getting FTTP supported. I am actually a registered Hyperoptic Champion for my building, I did manage to get 28+ residents to register their interest 3 years ago within 6 months or so. But I am still waiting for wayleave agreement by my Building Managers, I hope it happens one day. But this has been a frustration as the Building Estate keep saying they are busy with other priorities at the moment such as Fire safety following the Grenfell Tower incident last year. The same I can see now with BT Openreach. My Bishopsgate is an Exchange Only Line (no FTTC supported in my area) but it now shows as a plan to be upgraded to FTTP. Of-course, again my concern is wayleave agreement and this is a potential problem many residents may face who live in apartment blocks which may delay the FTTP expansion.